Make an extra copy of the file. Open the “File” drop down menu and select the “Save as” option. The “Save as” dialog box appears. 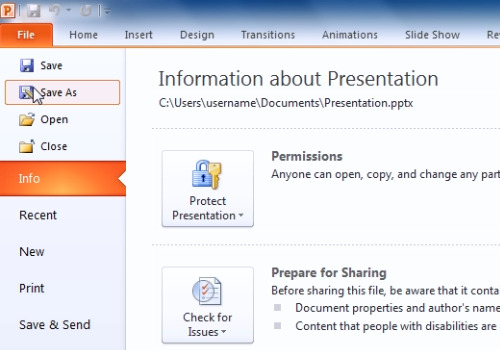 Type the name of the presentation in the “File name” field and press the “Save” button. 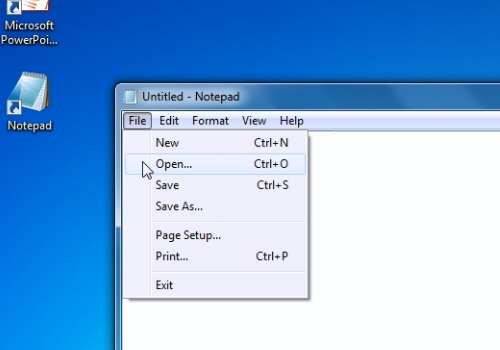 Open the “Notepad” program. Then click on the “File” drop-down menu and select the “Open” button. In the appeared dialog box select “All files” from the “File type” drop-down list and open the saved presentation. The presentation opens as a text. Type one space in the very beginning of the text. Save the file by clicking on the “Save” option in the “File” drop-down menu. Now you have a corrupted presentation.